UNITED NATIONS, December 22 -- As the UN Security Council on Wednesday authorized 4000 more AMISOM troops for Somalia, Inner City Press was told that the Transitional Federal Government's new foreign minister Mohamed Abdullahi Oomar has taken to writing his own letters to the UN to support members of his clan, without the approval of the president. 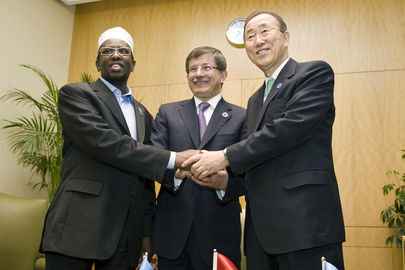 Inner City Press has already exclusively reported on the attempted re-entry into the Somali Mission to the UN of Idd Beddel Mohamed, who had been serving as Somalia's Deputy Permanent Representative to the UN until late 2009, when he was recalled to Mogadishu. 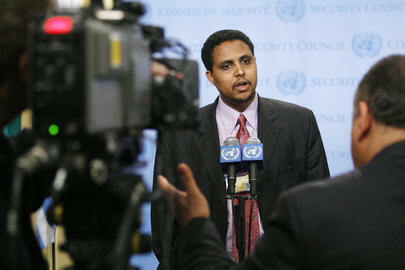 Idd Beddel Mohamed did not want to go to Mogadishu, and so went to Canada, knowledgeable sources say. But when Mohamed Abdullahi Oomar from his clan became foreign minister, Idd Beddel Mohamed came back to New York -- on what type of visa is not clear -- and showed up at the Mission, saying he was back. When he refused to leave, the police were called to remove him. Then Mohamed Abdullahi Oomar wrote to the UN, as foreign minister, stating that the current Permanent Representative is being called back to Mogadishu, and that Idd Beddel Mohamed should be treated as Ambassador. Despite Ban Ki-moon's December 21 speech to the UN General Assembly asking their Credentials Committee to act on letters from Ouattara switching away from Gbagbo's Permanent Representative Djedje, normally the UN does not get into conflicts inside Missions to the UN, or between a country's president and foreign minister. In this case, closely placed sources complain that Mohamed Abdullahi Oomar should never have written these letters, which they say were not authorized by the president. The upshot is that the government is in disarray, or still subject to clan fights, even as the TFG is supposed to end in 2011. What will come after it? Watch this site.